Are you married to or in a relationship with a Mama's Boy? He talks to her every day or almost every day. It’s one thing if your guy talks to his mom once a day because she has no one in the world but him (which is still a scary thought), but if he and his mom have telephone conversations multiple times a day to gossip or just tell each other the little things that girlfriends usually tell one another, this is a huge "red flag." What makes this so frightening is the fact that when anything significant, or insignificant happens in his life, the first woman he thinks to call is his mom, not you. She knows about it before you do. Has he ever eaten something you fixed and then actually said he "wishes you could make it just like his mom?" It seems like every day his mother is mentioned in most conversations to the point where you begin to hate the sound of her name. You begin to realize that in his eyes his mother DOES EVERYTHING better than you do. She would not say things the way that you do, she would find nothing wrong with him at all, she would agree with everything that he says, etc. She has him on a pedestal. Basically she is a "saint" who he has placed on a pedestal a little lower than God Himself. When you question him he denies any wrong doing on her part, says his childhood was great, says that she was the best mother that anyone could have and that she is the "Woman who gave birth to him" so he is not going to trash his own mother. This kind of thinking pretty much allows her to get away with anything. The reality is usually quite the opposite. She may have been the worst cook in the world, she may have never loved him UNLESS he was taking care of her needs, she is in reality a narcissist who sees everything that happens in the world as if it revolved around her. She probably turned him as a child into a surrogate husband because either she was divorced, widowed or single and was not close to her husband if she was still married to him. She forced her son to wait on her hand and foot, and she showered him with very unhealthy attention that bordered on looking at him as her spouse instead of her son. He compares you to her even though he says he does not, unconsciously he is and he does. You may have thought it was a good sign when he said you were just like his mother, whom he loves dearly. But now that you are married to him you realize that he actually "worships" his mother like she is "God himself" and you are just one of the other people in the room with no special qualities. Even though he lives on his own, his mother goes to his place to clean up for him and drop off food. It seems that she still babies him after all these years. And he loves it. He even manages to justify that he’s too busy to cook and clean, and since his mom has no problem doing it, he lets her. Or what’s worse; he pays her to take care of him. If he is married she still buys him clothes, takes him out to eat, and even comes to his place of work to either help him or just watch him work. These are things that a wife does for her husband, not a mother. But what happens is the wife can never do it BEFORE his mother does. She always beats the wife to it. If his wife was going to bring him lunch on the job, the mother gets there first. Finally, the wife just gives up and lets the mother "DO HER THING" and she does not dare say anything about it to her husband for fear of his turning on her for daring to criticize such a "saintly" woman. What he does not realize is that NORMAL mother-in-laws DO NOT interfere in such a way with their son's married life. They know that the wife cooks for him, cleans, buys him clothes, etc. and that those things STOPPED when he became a man and got married. She knows that her "mothering role" is OVER. His mother STILL regards him as a "child" who she still "mothers" and "has to take care of" and she regards his wife as the "OTHER WOMAN" who needs to be removed. The last time you went over to his mom’s place (which is probably weekly), she asked you if your test came back from the doctors. Shocked and utterly confused, you answered “yes” and were quick to change the subject. Lo and behold, your husband/boyfriend told his mom about your test at the doctors and thought nothing of it. You, on the other hand, begin to wonder what else he has revealed about you to her? Eventually you find out that she knows EVERYTHING that happens in your lives, including when you have a fight. ALL couples fight. But she is especially glad to hear that you do. She wants to know everey single detail, hoping against hope that the fight will be the one that "is the last straw" in your relationship. When your husband tells her what the fight is about, regardless of how fair it is and the fact that he may very well have been completely WRONG, she takes his side against you, and even encourages his wrong thinking. She will even come up with reasons why he should continue thinking badly about you. Does this sound like a woman who really wants her son's happiness? Or does it sound like she could care less about his happiness and just wants him to come running back home to "mommy." ? Before he makes any decision, whether it be buying a home with you or heading on a fishing expedition with the boys, he consults his mom for her input. This can come under the disguise in his mind of just "letting her know his plans" but in reality he is seeking her blessing and approval of whatever decision he just made. What’s worse is that her advice is usually "taken as gospel" and there’s nothing you can do or say about it. And if you try, whoa! Your husband/boyfriend will huff and puff and get mighty upset with you. What he fails to know or admit or realize is that REAL MEN DO NOT tell their mothers everything that happens in their lives and they do not seek out her advice, and they do not talk to her about things that they talk to their wives about. They see their mothers as mothers who raised them and then LET THEM GO to another woman to love and cherish them. This is what the Bible means when it tells men to cleave unto their wives. "For this reason a man will leave his father and mother and be united to his wife, and they will become one flesh". “Therefore shall a man leave his father and his mother, and shall cleave unto his wife: and they shall be one flesh” (Genesis 2:24 KJV). Other translations render “leave and cleave” as “leave and be united” (NIV), “leave and be joined” (NASB), and “leave and hold fast” (ESV). So, what precisely does it mean to leave your father and mother and cleave to your spouse? As recorded in Genesis chapter 2, God created Adam first, and then Eve. God Himself brought Eve to Adam. God Himself ordained that they would be joined together in holy matrimony. He said that the two of them would become one flesh. This is a picture of marital intimacy—the act of love that is never to involve anyone else. To “cleave” means “to adhere to, stick to, or join with.” It is a unique joining of two people into one entity. It means we do not quit when things are not going right. It includes talking things out, praying things through, being patient as you trust God to work in both of your hearts, being willing to admit when you are wrong and asking forgiveness, and seeking God's counsel regularly in His Word. Question: "What does it mean to leave and cleave?" If either spouse fails to both leave and cleave, problems will result in a marriage. If spouses refuse to truly leave their parents, conflict and stress result. Leaving your parents does not mean ignoring them or not spending any time with them. Leaving your parents means recognizing that your marriage created a new family and that this new family must be a higher priority than your previous family. If spouses neglect to cleave to each other, the result is a lack of intimacy and unity. Cleaving to your spouse does not mean being with your spouse every moment or not having meaningful friendships outside of your marriage. Cleaving to your spouse means recognizing that you are joined, essentially “glued,” to your spouse. Cleaving is key in building a marriage that will endure hard times and be the beautiful relationship that God intends it to be. If you and he are in the presence of his mother and she’s says something insulting like, “Remember your ex-girlfriend, David? Oh, she was a fantastic girlfriend." And you are standing right there and she says this right in front of you as if you do not exist. And he doesn't say a word in your defense. Believe me, she is trying to start a fight between you. But if you dared to say anything remotely insulting about his mother in private, like “I can’t stand it when your mom belittles me,” he immediately jumps to her defense. It seems you just can’t win. If you are dealing with an evil mother-in-law who has created a mama's boy for a son and you need some help and advice as to how to handle the situation so that you don't go crazy or loose your marriage or relationship over this, please do not hesitate to contact me. There are some very constructive things you can do to change the dynamics between your husband and his mother. Just exactly what is a Mama's Boy? 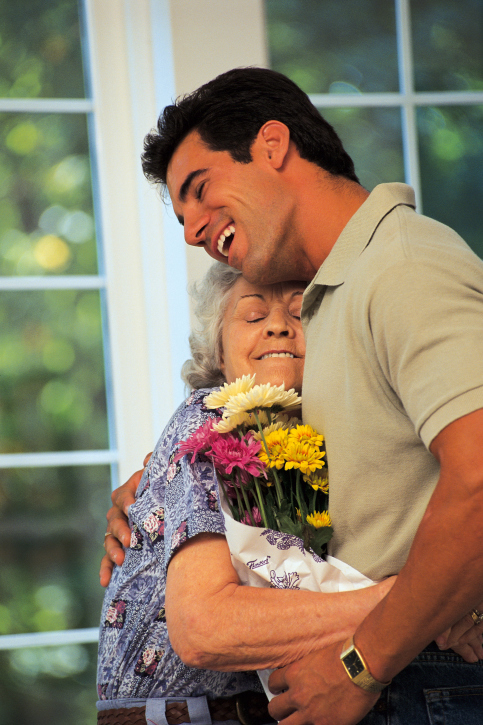 A Mama's Boy is a man who has not broken the apron strings with his mother. He is in a relationship with another woman or is married to another woman, BUT his mother is the one who receives most of his time and attention. He will call her at least once or twice a week with whatever exciting news he has, or any disappointments that he has. She will know as much about the his life as his wife does, and maybe even more than his wife does. He shares the same things with his mother that should only be shared with his wife. "She might be a saint, but it doesn't mean that she can't be unreasonable and manipulative"
Although Patricia Jones, M.A. schedule fills quickly, she is creative in working with you for an appointment. She will return your phone call within a few hours of receiving it. Or respond to your e-mail question usually the same day that you send it.